Slí na Bandé: What is palm oil? 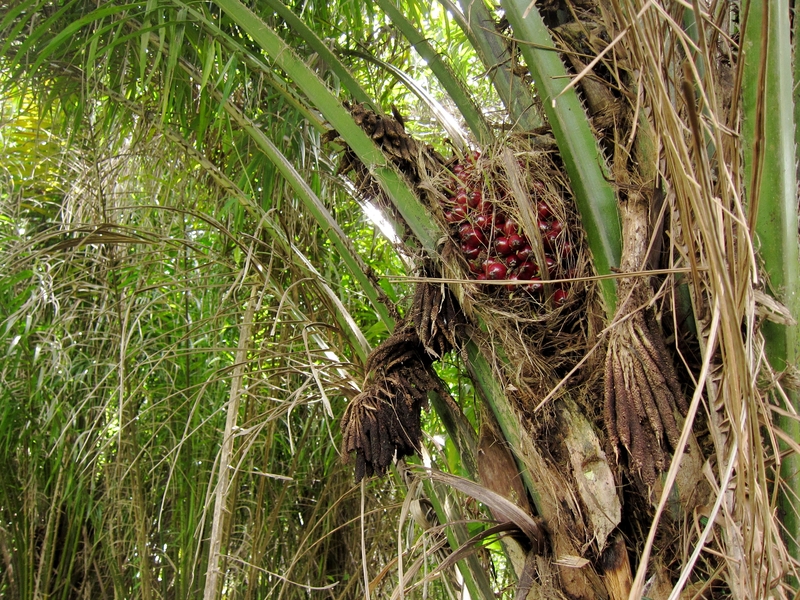 The term “Palm oil” commonly refers to Palm Kernel oil (extracted from the seed of the oil palm tree) and Palm oil (extracted from the fruit of the oil palm tree), both derived from the African palm tree Elaeis guineensis. These oils are nowdays widely used all over the world for food products as well as for biofuel fabrication. 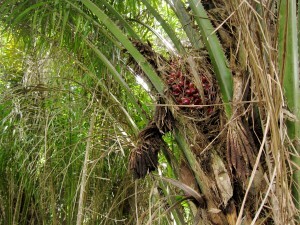 Among many issues concerning this matter, the increased destruction of the rainforests to grow oil palms trees and the corollary environmental degradation, the violation of human rights suffered by expropriated farmers and forest communities, and the health issues brought up by the consumption of these oils, are particularly subject of debates. These substances must not be confused with coconut oil, which is derived from the fruit of the palm tree cocos nucifera, also called coconut palm and used in many tropical countries for decoration as well as for its culinary uses. – Use of palm oil as an ingredient in many processed foods. According to the oil world trade journal, 48 million tonnes of palm oil and palm kernel oil were produced in 2008, which represents 30 % of the global production of oils for this year. One of the reasons why oil palm culture took such an important position in the vegetable oil cultivation is that it’s the most productive vegetable oil crop, yielding more oil per hectar than any other vegetable oil crop (69.4 % yield oil per hectare for palm oil, 10 % for rapeseed, 7.6 % for sunflowerseed, 6.5 % for soybean, 4.3 % for peanuts, and 2.2 % for cottonseed). Regarding to this great productivity, the governments have chosen once again to make the economic interests prevail over the protection of the environment and the respect of Human Rights. Palm oil production is in particular responsible for a massive deforestation, the destruction of many endangered species and a significant increase of greenhouse gas emission. It’s also the cause of many social and Human Rights abuses, from low pay and poor working conditions, to expropriation and murders. According to the US Center for Science in the Public Interest, the human consumption of palm oil would also be responsible for many health problems such as an increase of cholesterol in the blood and a promotion of hearth diseases.